Bill of sale is a particular paper that handovers the ownership of goods from one person to another. 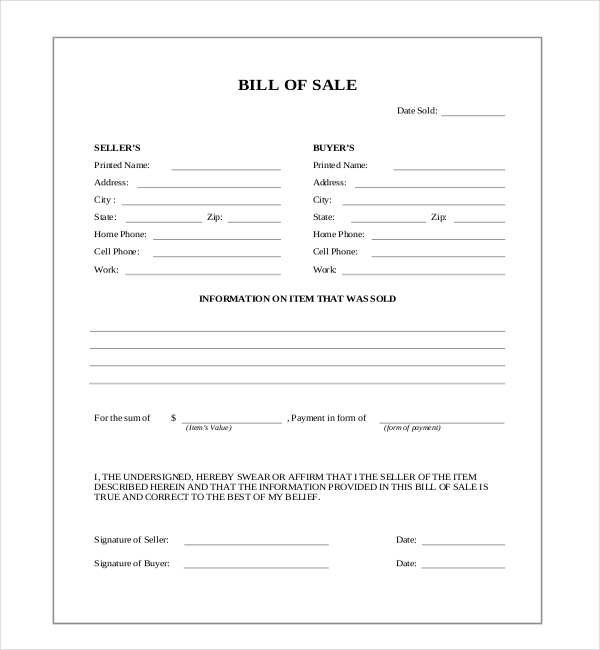 Bill of Sale Forms can be used for many purposes like exchanging of goods, selling goods, mortgage for loan and give your friends/relative as gifts. These forms are used for legal purposes and it is proof of transaction of the goods. When you buy any kind of goods, a legit transaction takes place with a few papers to sign. It is not possible to sell a car if the seller does not give a Bill of Sale form. 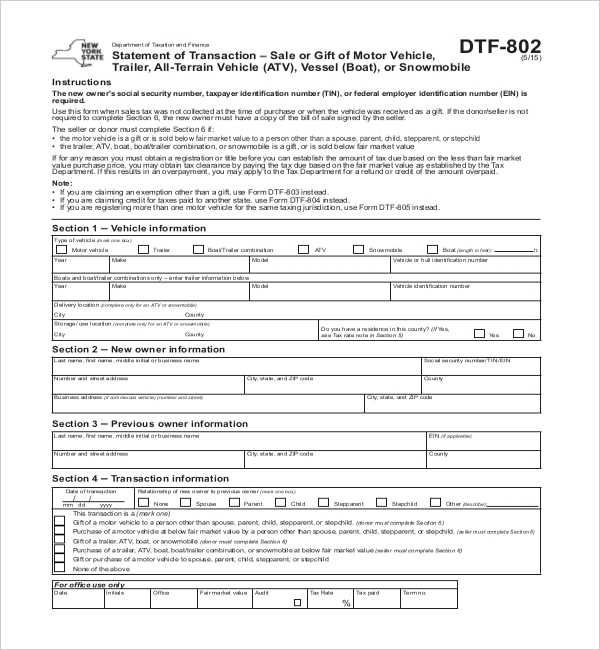 This template is for the requirement of information about the vehicle. The completion in filling this form does not mean that you get the license name and neither does it act as a Report of Sale. This is the form for selling Motorbikes and even if you sell it in a discount price, this form can be used. This is the strongest and only evidence that a contract had been legally signed between the purchaser and the dealer for the Motorcycle in question. If a state requires that sellers fill the Blank Bill of sale before selling the mobile home, then this template would be quite useful for you. Blank Bill of Sale Form for Mobile Home is available easily online, so one does not have to create it from scratch. Many people buy second-hand or used cars nowadays as they are cheaper and are available easily. Using a Bill of Sale Form for Used Car would be helpful as paper works are important these days to avoid hassles. This form would at least make the transfer of ownership of the used car easier. This template is for people who want a boat. 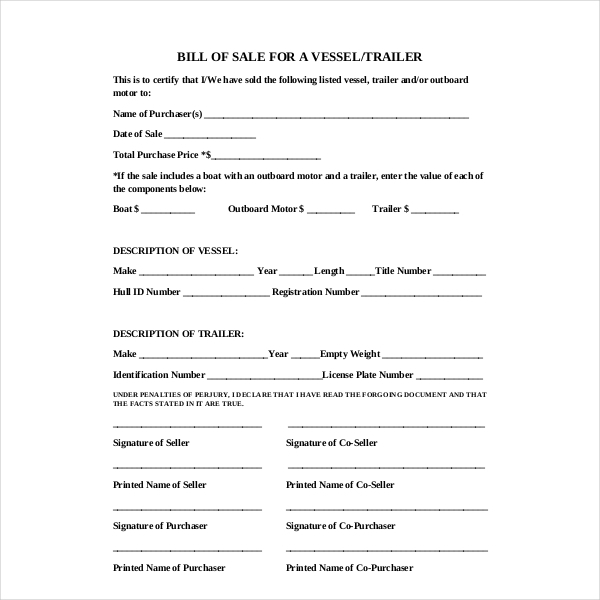 The selling of a boat will need this form. Bill of Sale for Boats is found in the internet, without any cost. It is free and easy. Generally, you will find it in a PDF format, but you can also find it in a word document format as well. 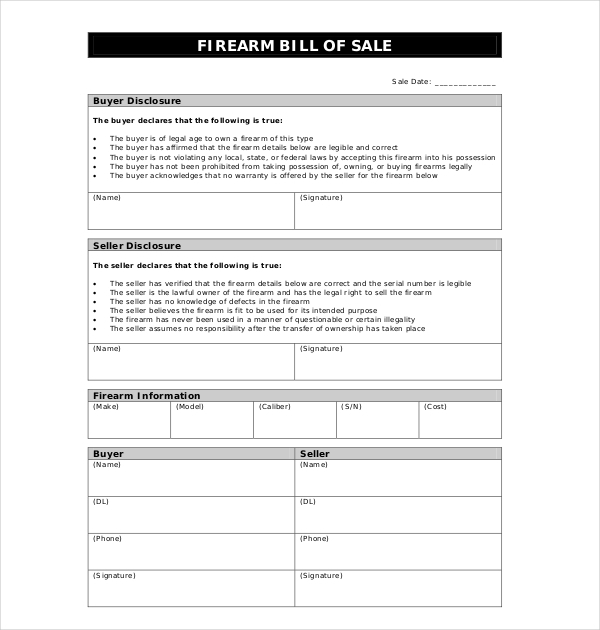 If a person has a gun to sell, he/she might want to consider signing a Bill of Sale form for Guns. The reason for the documentation of such goods is for protecting the wellbeing of buyers. Also the state needs you to fill the bill of sale template as a legal contract and transfer of ownership. Issuing a bill of sale builds a certain amount of confidence between the seller and buyer because the transaction in question is a legal one. 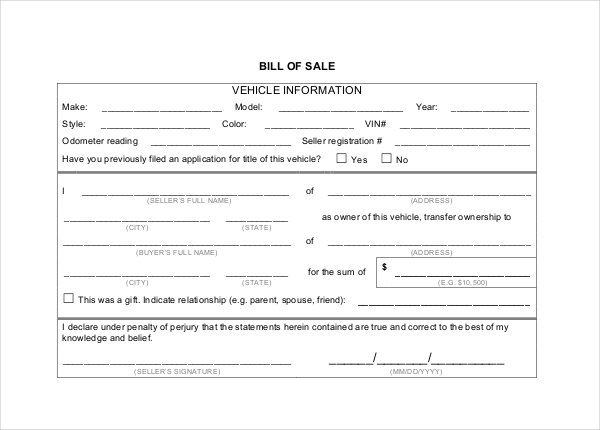 For instance, if a person is buying a vehicle, a buyer will always ask for full ownership of it and the only way to do it is fill this General Blank Bill form. 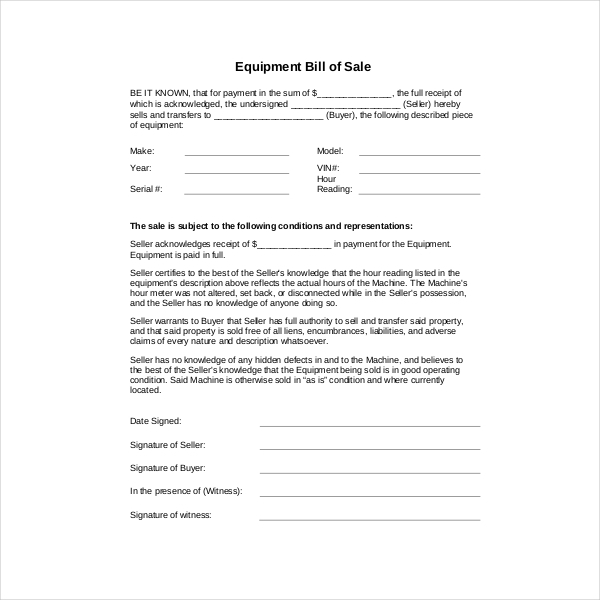 To sell any equipment, you can use this template for transfer of ownership. The equipment can be a month old sofa, bed or a cabinet. This can also be used for transaction relating to vehicles but seller can use this for recording the transaction of equipment. 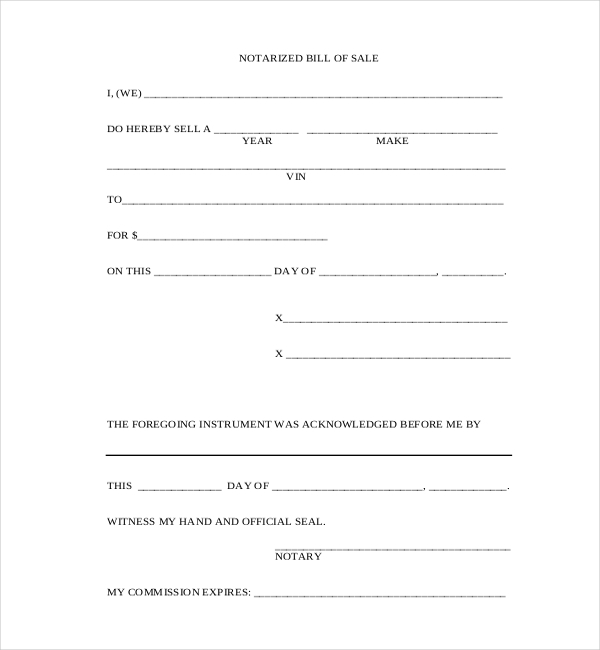 Bill of Sale Form with Notary comes for free. Even if this is not a compulsory Bill in some places, buyers may ask for it for the sake of mental satisfaction. It is always better to have paperwork done for anything you buy. It is a small form stating details of two parties, and equipment/goods detail. Any transaction, be it a car, boat or gun, there must be a form for transfer of ownership. Buying of a boat or furniture is not really as similar as buying vegetables in a market. A proper negotiation is done between the two parties, i.e., a seller and buyer, and legal process starts. Bill of Sale Form New York is perfect for this. This for is for buyers and sellers who have a mutual interest in a good. People who love travelling can also be interested in such forms as they are usually interested in buying vehicles, boats and bikes. For those who have work related to delivery of items may find these forms quite useful, as they are in need of vehicles, be it new or used. Using a used vehicle is always cheaper in monetary terms. 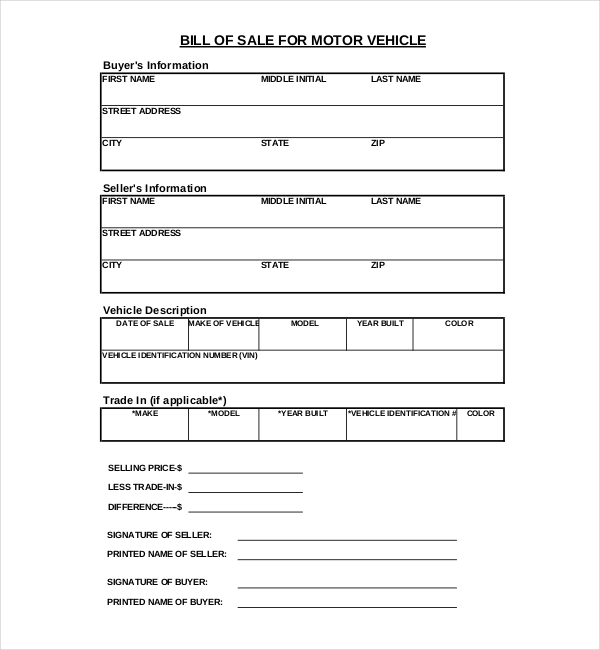 A blank bill of sale form widely consists of details of the buyer, the seller and full details of the goods/vehicle that is under transaction. Vehicle description details like- name of the vehicle, year it was bought, model number of the vehicle, vehicle serial number, registration number, license plate number, design of the vehicle, faults and features are a few things that must be there in the forms. The buyers/sellers name, residential address, contact number must be there. 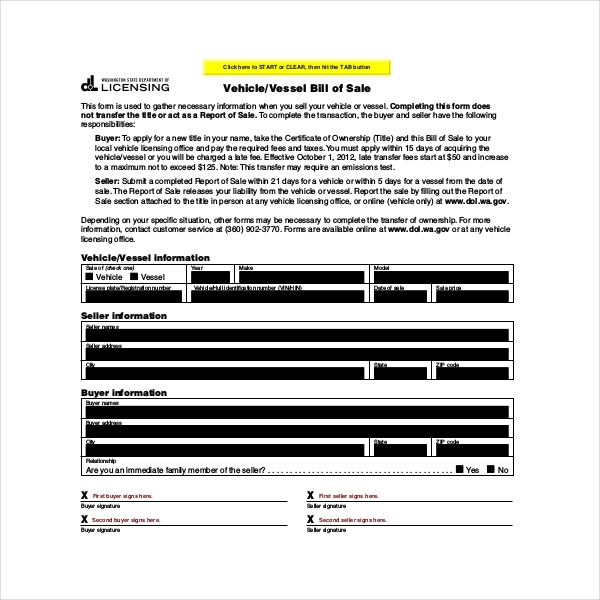 For used car bill of sale forms, the details of the vehicle description must be there in addition to how much it has been used and for how many years. Price and other is a mandatory field to include. The sign of both parties must be done with the dates. A research about the laws under ‘Bill of Sale’ must be done in detail before starting a transaction. This will give you an overall idea about what you are dealing with. Mostly, the buyer must know all the rules before creating their own document. Keep in mind that the form has all the details required for the transaction of goods/vehicles. If any doubt, clarify them immediately. Make sure all the information is legible and that the seller or buyer has a legal Identification proof of him/her. This is important because there are a lot of counterfeit cases coming up with fictitious IDs of cars and the person itself. Be sure to make a copy of the Bill of sale templates/forms for safety purposes. If possible, get original papers of the vehicle/goods that are in question. All of this is for precautionary measures in future, if needed. Some people like recording the whole transaction with a third person as an eyewitness as well. This can be both from the buyer and the seller side. This is done for extra safety reasons. It is advisable that the forms that are mentioned above should be used by adults and not teenagers and kids. These forms and templates are for goods that are mostly used by an adult, i.e., by persons who are above the legal universal age of 21. This is because they are dealing with legal paperwork which needs a person who is legally adult in their state. Although, the demand of such forms is not compulsory in all the places, it would be a wise choice to do such a thing just to be on a safer side. It is a kind of a written agreement that between both the parties about the goods bought. The buyer will need you to fill and sign a bill of sale form.